How and when did you first start composing? I first started composing as a teenager – I was writing some over complex Prog Rock with crazy time signatures and long breakdowns and keyboard solos… So much work and tight trousers. My first sequencer was an MC500 which took some programming to orchestrate on, but it was fantastic – my first big orchestral work still lies unrecorded. What was the path or the turning point that landed your first major scoring gig? I met Director Nick Hurran at a party, and he said he was looking for a composer for a small British movie called Virtual Sexuality…I asked him to pitch the movie to me and then went home and wrote a couple of demos and sent them to him…Luckily he bit, and we’ve worked together again over the years and remain great friends. Who/what are your biggest musical influences? I’ve always admired Frank Zappa more than anyone in recent years. He was innovative, obsessive, hilarious. I owe a lot to my old friend Hans Zimmer as well – he taught me an enormous amount over the years – not least about passion and Movie shaping. We’d love to hear a little bit about your creative process. How do you usually get started on a piece? I love to absorb the story fully before writing. The best themes always come when you’re invested in the characters. If I’m writing a melody, I’ll usually spend time on the piano before moving over to a sequencer. Melody is the best place to start. Once I have the hook, I like to write a suite of music with it – that can be useful to throw around the place to see if it feels good against the picture. If it does – that’s when I start to write in sync with the movie. Do you ever encounter writers’ block; what’s your remedy to cure it? I leave the room quickly and go do something unrelated to the work. I go see the horses I breed and decide on their next race or mate, or pick up an instrument and play it to death outside somewhere. I used to lie in a fetal position at the back of the room and force the ideas out…but things flow better for me these days – let’s hope it carries on! It looks like the very successful Wonder Woman was your first foray into the comic book superhero movie trend – what was it like scoring a film where the characters and story are so recognizable? Does that change your approach at all? It was such great fun writing for Wonder Woman. Although Diana is a recognizable character, we hadn’t seen her origin story on screen before, so I found the place to plumb for her sound at the beginning of the story. I had a great theme already written by HZ and Junkie – I just needed to start the story and take it to that ultimate warrior theme. What’s your studio setup like? (DAW/Hardware systems); do you have a favorite piece of gear (or plugin)? I use Cubase and Pro Tools to mix and to play back picture. I use VEPRO to connect to a couple of Beefy machines running mostly Kontakt. My favourite plugins are Soundtoys – I use Echo Boy all the time – and I’m using Micro Shift on a chunky Double Bass riff I played this afternoon…the package is awesome. If you could snap your fingers and have any virtual instrument custom-tailored for you, what would it be? I’d like to be able to play live into Cubase, and have the audio automatically cut, acidized and placed into presets in a sample playback engine with the filters of Moog, the reverbs of Waves, and the delays of OhmBoyz onboard. What role do Heavyocity products play in your work? I have at least 50 MIDI tracks in my template from Heavyocity open all the time. Both Tempo synced loops and their corresponding multi samples. I find that I can go and find a percussive kit, or a loop that will fit into most projects that I work on. The sounds are awesome and pristine, or massive and dirty. Damage gives you 30 GB (16GB on disk) of drama, fusing industrial sounds and orchestral drums into a devastating electro-acoustic barrage. 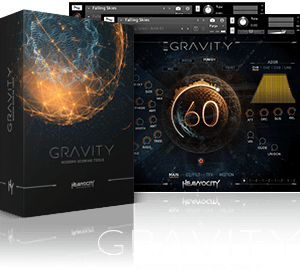 Powered by the Kontakt 5 (Kontakt 5 Player) engine, Percussive Kits provide more than 200 deeply sampled percussion sources, and over 500 single-shot elements, recorded in up to seven velocity layers and with up to nine round-robins per drum.